I am so excited to announce a great new local resource to the community of Silver Lake! Welcome to the neighborhood, Tribeca Pediatrics! Conveniently located on Sunset Boulevard just opposite Local and the Thirsty Crow, Tribeca Pediatrics will be offering a range of services to both expecting mothers and children of all ages. Come take advantage of the complimentary classes in celebration of their recent opening! Read on to learn about Dr. Monika Symms and for more information! Learn how breastfeeding works now, before the baby is born. Topics will include: proper positioning, nutrition, pumping, and more. An informational session about feeding and nutrition for your infant and child. Topics will include: when to feed solids, what foods to give, food allergies, addressing the picky eater and more! This class will cover childbirth incorporating the best information from various methods (Lamaze, Bradley, etc.) Topics will include: How labor works, coping strategies, what to expect, and more. Please register for the classes through the webiste: https://www.tribecapediatrics.com/home-california/ as places are limited! Dr. Monika Symms is a board certified pediatrician who earned her undergraduate degree from New York University and her medical degree from Poznan University of Medical Sciences in Europe. She completed her residency at the University of Medicine and Dentistry of New Jersey (now Rutgers New Jersey Medical School.) Monika is originally from New Jersey but now happily lives in Los Feliz. She joined Tribeca Pediatrics in 2010. Sure, the bitty babble is precious and cute, but where’s the line? How long is it okay for them to be chatting in a language all their own? Insert the perfect speech class here, offered by the directors of Echo Speech Therapy. Hone pronunciation skill and build language all in one day. Choose from one or both sessions, being taught on April 5, 2014 at Wallaby in Silver Lake. 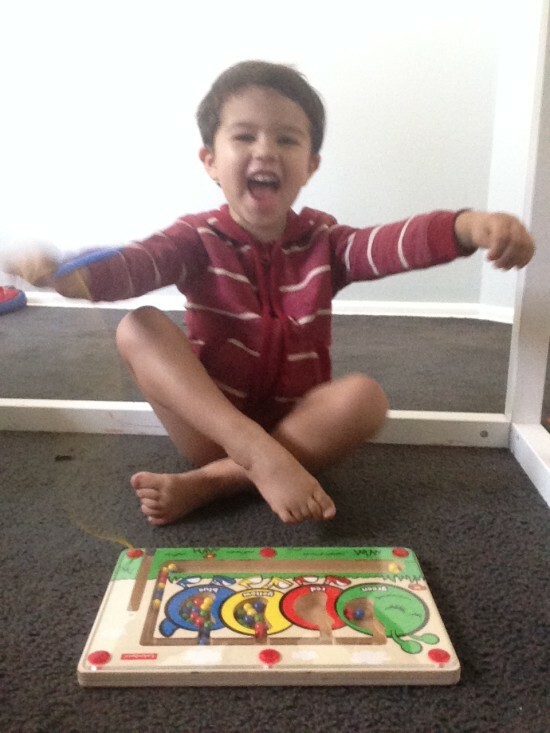 Are you looking for hands on activities to improve your preschooler’s communication skills? Join us for interactive classes taught by speech-language pathologists designed to empower parents of 2-5 year old children! Now offering a 20% discount to Silver Lake Mom readers! Okay. This might very well be Rhys’s newest obsession, an obsession I am thrilled about, as it a) does not make noise and b) does not make a mess. YES. Success. 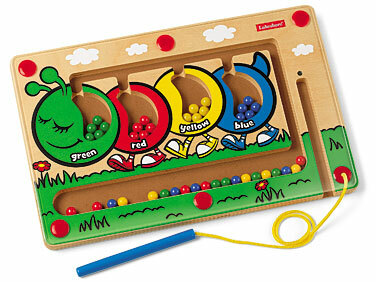 The Colorpillar Magnetic Maze from Lakeshore Learning has even more benefits than being self-contained. It demands concentration and deliberate movements, which helps hone my son’s fine motor skills, color sorting, organizational skills and patience. This game is great for the house, but even better for road trips and travel. The plexiglass surface keeps all the pieces intact, and the magnetic wand stores easily in a slot on the right side. 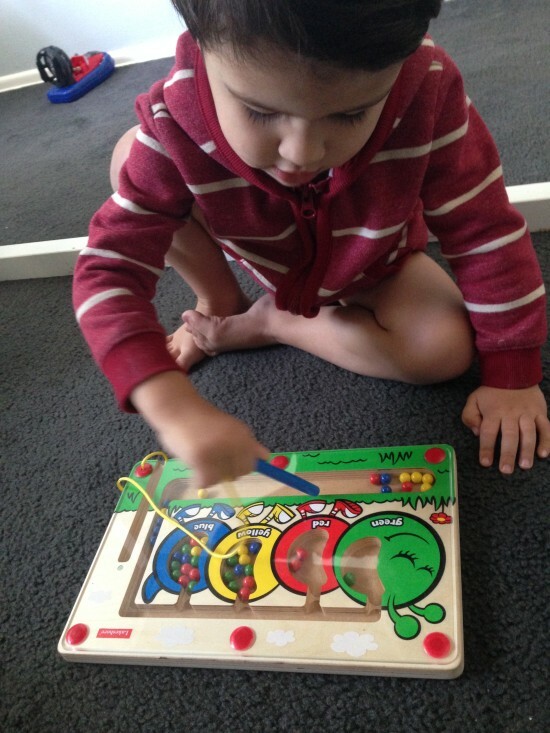 This is a game that helps quiet him when he’s being loud and rowdy, a game that is rewarding. He squeals with joy after he’s dragged all the colored balls into their appropriate section. happy birthday to the honest company! I am a big fan of all things Honest: diapers, baby skin care, home cleaning products, lip balm, candles, you name it. Thumbs up. In celebration of their second year as a company, they’ve shared a little list of things you can do in two (minutes, days, months, years) to make life a little better than before. I was inspired; I hope you are, too. It’s hard to determine childcare needs when your job isn’t a nine-to-fiver. My husband runs a concert venue, which means his work day spans from 2pm-1am. I mostly work from home, but often find myself with unanticipated changes to my schedule: a meeting has shifted to a later time in the day, a client requests a last-minute event venue walk-through, or, my favorite, a show gets cancelled at the theater, leaving my husband and me with an unexpected night off together. Impromptu date night, please? It’s difficult to find last-minute sitters and equally difficult to find those whose schedules are flexible. Personally, I hate trying to find someone to watch my son in the eleventh hour. It’s stressful, makes me anxious about asking with little to no notice, and I always feel like it’s disrespectful to the people I’m asking. What’s a family to do when their schedules are a little wacky and unpredictable? My friend, Autumn has found herself asking this question since her first son was born in 2011. A working actress, her schedule is at the whim of directors and production companies, and often her work takes her out of town, like when she found herself living in Hawaii for over six months while filming the series, Last Resort. During her second pregnancy, she was determined to find a better strategy for her existing childcare routine, which was cobbled together with overnight stays by her mother, one part-time nanny, and a handful of babysitters. 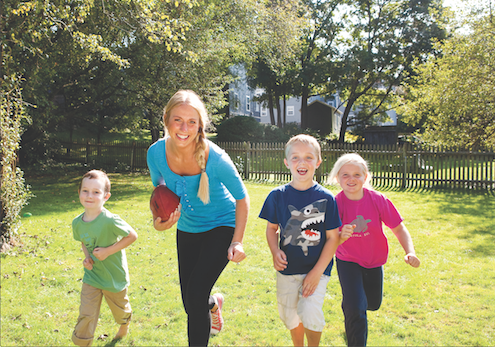 Autumn emerged from her research with a great solution: a live-in au pair. 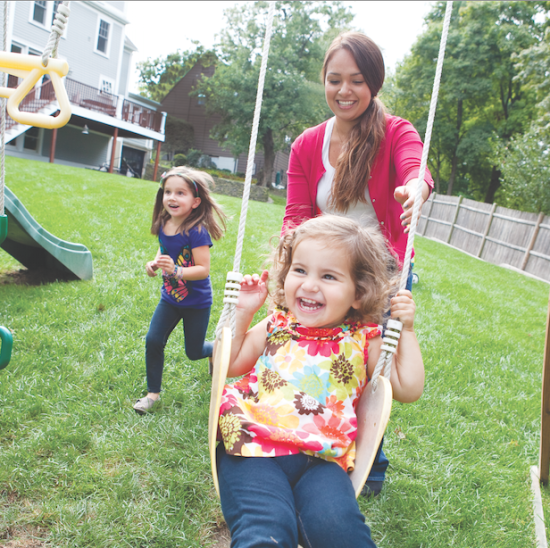 After finding Cultural Care Au Pair, Autumn engaged an in-depth screening process, of both her family and of potential caregivers. She found Delphine, a cheerful, warm and jovial young woman from the suburbs outside of Paris. Delphine joined her family this past October, six weeks prior to her second son’s birth. Autumn and I spend quite a lot of time together working on our site, Move LifeStyle, while our sons play together under the careful eye of the Delphine as we work. The boys love to play with Delphine. Upon our departure, my son musters up his best, “Merci, Delphine,” and smacks a big bisou on her cheek. Our experiences with her have been nothing but delightful. Why host via Cultural Care Au Pair? Have you hosted an au pair? How did you find the experience? Share your comments below! Hey there, moms and moms-to-be! We’re throwing a huge giveaway over on my other site, Move LifeStyle! 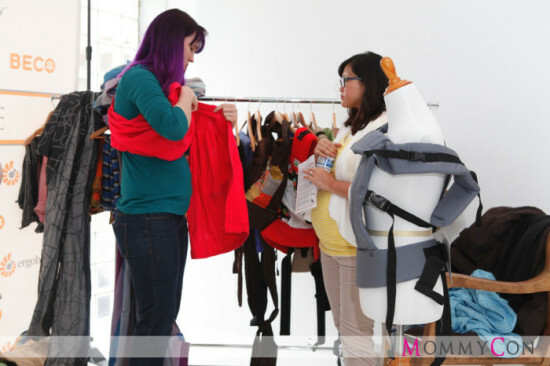 Enter to win over $1000 work of baby and maternity gear. Please spread the word! Contest runs through the weekend, so be sure to enter quick! For more details on how to enter, visit Move LifeStyle. Read on for more info on the prizes and why our editor-in-chief, Autumn Reeser loves them all! It’s a Baby Shower for YOU! BumpNest Body Pillow Since discovering this magical invention, I am now firmly convinced that EVERY pregnant woman needs this body pillow! It wraps all the way around you and is the coziest most comfortable sleep tool imaginable. Just trust me on this one. Ingrid & Isabel This brand makes the most comfy clothes for pregnant women and new moms. (I’m wearing one of their striped tees as I write this actually!) We’re giving away a super-soft Lounging Top and a pair of cozy Pants. Bravado Essential Embrace Nursing Bra and Tank These are so great for new moms, plus Bravado is also running a really cool Twitter campaign to benefit LoveRecycled. Tweet a picture of you and your little one and the hashtag #EssentialEmbrace to participate! Itzy Ritzy Reusable Snack Bags These waterproof bags take the place of Ziplocs, are cuter and much better for the environment. Sold. I have the dinosaur print but you can choose your favorite! EasyLunchBoxes Designed by a mom of three, I use these bento-style lunchboxes every day to pack Finn’s lunch. It seems like such a simple concept but it’s brilliant in the amount of time it saves you! Get four EasyLunchBoxes and a carrying case. Stokke HandySitt Travel High Chair I love absolutely everything this Norwegian company designs. Practical, minimalist and easy on the eyes, this high chair travels with you and baby. SkipHop Lunchie and Accessories I think I’ll always be obsessed with all the cute little animals SkipHop comes up with to grace their lunch boxes and backpacks! Finn’s currently rocking the shark, but you can pick whichever animal you like best. Aden & Anais Swaddle Blankets These are my absolute must-have for every new parent. You will use them for EVERYTHING. They’re light, breathable, durable and beautiful and you’ll get a four-pack of your choosing. Baby Clothes from The Line by Ale Mulchy I found these on Etsy, pinned ‘em on my baby page and they promptly gathered over 500 repins within two days! So, suffice it to say, Ale’s clothes are adorable, everyone loves ‘em and I hope you win these cuties. Tortilla Baby from BonVivant Baby C’mon, who hasn’t looked at a newborn all swaddled up and said, “He looks just like a little burrito!”? Well, now you can make your husband’s favorite saying into reality with Burrito Baby. It’s awesome. ZoLi Bunny Teether This is just so stinkin’ adorable. You know you want it, too. Also, all of ZoLi’s products are made with environmentally sustainable production practices, so you can feel good about using it, too. 4Moms Bath Spout Cover 4Moms excels at making high-tech products for childcare and this temperature gauge is no exception. I always feel just a little bit more hip every time I use this or their baby rocker or electric stroller! This post was written by Autumn Reeser and was originally published on Move LifeStyle. I’ve led an incredibly active life ever since I was small. A dancer since the age of three, I have spent much of my life wearing leotards and tights. So when my first period arrived, the obvious choice was to wear tampons. There’s no way to hide a pad in a leotard or to move comfortably at the ballet barre with something bulky wedged between my upper thighs. Despite their ease and discreetness, tampons still aren’t the best solution for that time of the month. Each time I go to the store to stock up, I am always baffled by my choices. Still! “Do I want a multi-pack? How many of each size do I have left over from last month? Maybe I should just get all one size this time.” Inevitably, my calculations are almost always off, which sends me in a frantic return to made an additional purchase. It’s endlessly tiresome, but that’s all behind me now. I have discovered Softcup. Finally! Something that is easy and effective and requires less attention and worry than the usual lady products. Softcup is just what it sounds like. And better. It’s literally a soft cup that you insert and wear for up to twelve hours, then just pull and pour out. And you can’t even feel it! The blood accumulates rather than gets absorbed, which means there is zero risk of toxic shock syndrome, nor that uncomfortable feeling of removing a tampon that wasn’t fully saturated. Maybe that’s TMI, but any of us who have worn tampons surely know that feeling, and it’s not a pleasant one. Available in both reusable and disposable versions, Softcup is safe for our bodies: it contains no latex, silicone, phthalates, BPA, PVC or dioxins. It’s discreet, convenient, and so simple to use. And the best part? For every box of Sofctup sold, they will donate a reusable cup to a woman or girl in Africa. How cool is that? So I challenge you, ladies. Give Softcup a go over tampons and pads. I bet you won’t go back. I didn’t. Disclaimer: I received product and compensation for this review, but the comments and opinions expressed within are solely my own. 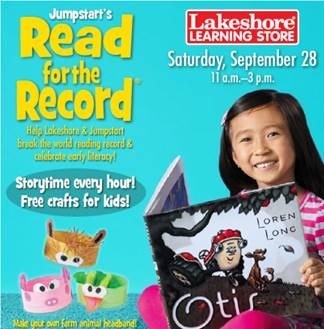 Thanks to Lakeshore Learning Store for hosting the recent Jumpstart Read for the Record event! What a great success. 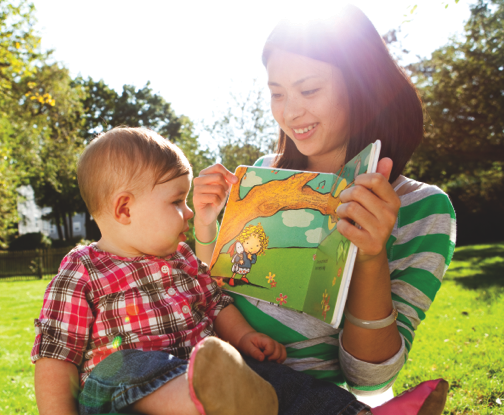 I hope these photos will help inspire you to read a little more to your child each day. After all, what’s one more bedtime story? The extra five minutes is so well worth it. hours on end in the pages of my most recently acquired paperback. 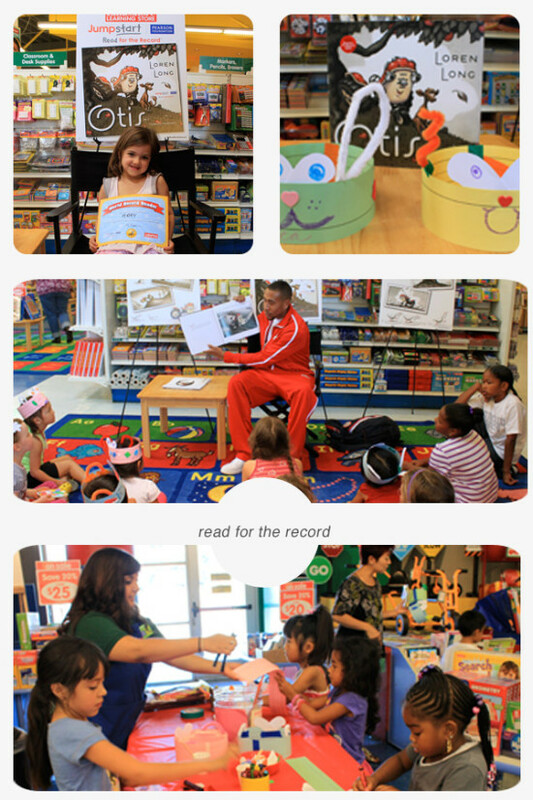 activities, come to the Jumpstart’s Read for the Record event! record for the largest shared reading experience. Calling all moms-to-be! 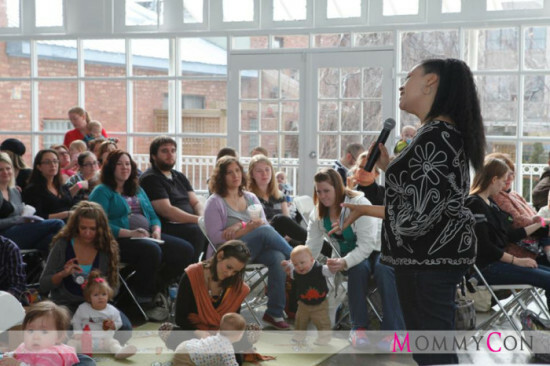 Mommy Con is coming to LA on October 6th to introduce products, answer questions, and discuss a range of topics including birth, breast-feeding, diapering, baby-wearing and more. 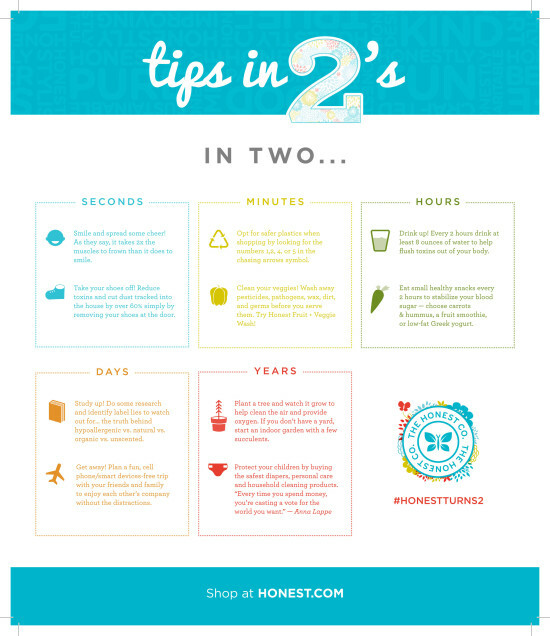 • Cloth Diapering Resource area –the pros and cons of clothing diapering, why? • Car Seat safety – infant (bucket) seats, convertible seats, combination seats, and booster seats – Each seat is good for a certain amount of time and it varies by the child’s age, height and weight. • Strollers – A stroller is a purchases that you really want to think on. Testing out a few different brands and models is key for finding the right one for your family.